Metal detectorist, Ken Pritchett’s brings us up to date on his most recent finds in the fields around Waltham. They include some fascinating discoveries, including part of a pocket calendar, 12th century coins minted in the reign of William the Conqueror’s son, a small medieval face (left). 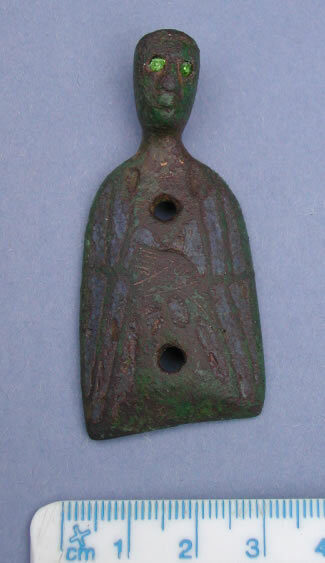 And far more mundane articles such as clog fasteners, brooches and belt buckles. Click here to read Ken’s latest article. I’ve met somebody who looks just like that face! Was it a child’s doll, do you think? I think it looks slightly spooky! It’s difficult to get an idea of scale, but it’s really tiny – maybe only 1cm in length. It’s only by enlarging the photo that you can see the detail. Ken thinks it formed part of a medieval casket. Just read the comments about the Limoges style head. The find was identified by the Government’s Finds Liaison Officer for this area. She dated it 1150 – 1300. 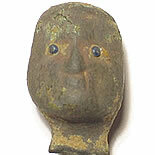 She described it as a Medieval copper alloy, gold and glass Limoges style head, probably from a casket mount. I had no idea what it was at that time. All the details are now on the UK Portable Antiquities Scheme database. 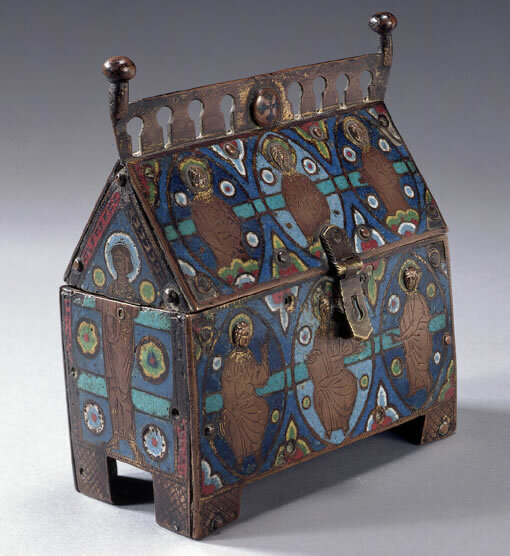 To show you what it may have looked like in its heyday I have attached an internet photo of a Limoges casket in the Rutland Museum, which really explained to me how they were used. The head you have is from a Limoges mount probably from a cross, and would have been riveted on. Click here to see one I found a few years ago. Steve could well be right in his thoughts on the head, but, unlike Steve’s mount which was fixed by two rivets on a plate below the head, this head has a large protruding rivet behind the head which suggests the head alone was fixed to a casket or similar object. We shall never know for certain but imagination is always to the forefront in this pastime. At least we agree on one thing – it is certainly a Limoges head.